Providing a rich GUI for Azure Data Lake Storage resources management has been a top customer ask for a long time, we are thrilled to announce the public preview for supporting Azure Data Lake Storage (ADLS) in the Azure Storage Explorer (ASE). With the release of ADLS resources in ASE, you can freely navigate ADLS resources, you can upload and download folders and files, you can copy and paste files across folders or ADLS accounts and you can easily perform CRUD operations for your folders and files. 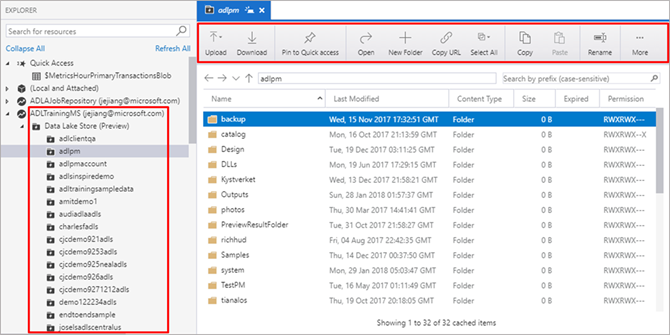 Azure Storage Explorer not only offers a traditional desktop explorer GUI for dragging, uploading, downloading, copying and moving your ADLS folders and files, but also provides a unified developer experiences of displaying file properties, viewing folder statistics and adding quick access. With this extension you are now able to browse ADLS resources along-side existing experiences for Azure Blobs, tables, files, queues and Cosmos DB in ASE.